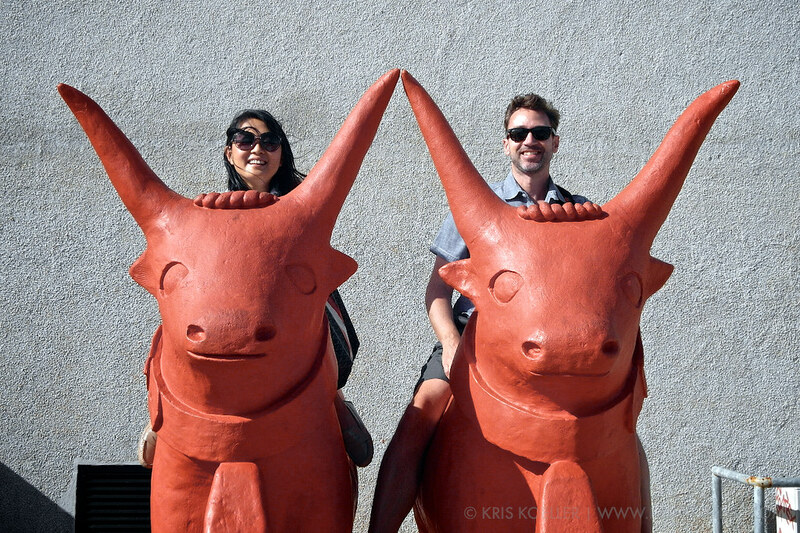 We just returned from an 8-day trip to Portugal, wherein we visited Lisbon, the Douro Valley wine region, Porto and the seaside village of Cascais. Despite traveling to Spain many times, I had never made the journey west to explore Portugal, and frankly didn't know much about it. We had read recently that the Douro Valley has been emerging as one of Europe's premiere wine regions, and the newly-established wine tourism industry was growing quickly. 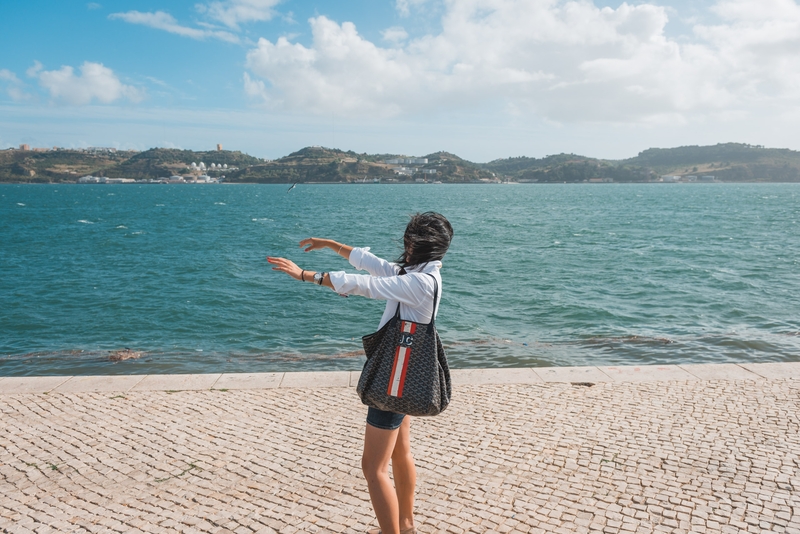 With work and personal schedules only giving us a week, we decided to explore central and northern Portugal, and leave the Algarve Coast and the Portuguese islands of Madeira and the Azores for another time. I took over 1,200 photos on this trip, and have divided these posts into Lisbon, the Douro Valley, Porto and Cascais. The flight to Portugal was an easy direct flight from Newark to Lisbon; leaving Friday evening at 8PM and arriving in Lisbon at 7AM. With the 5-hour time change, that's a 7 hour flight; about as long as traveling to Los Angeles or San Francisco. 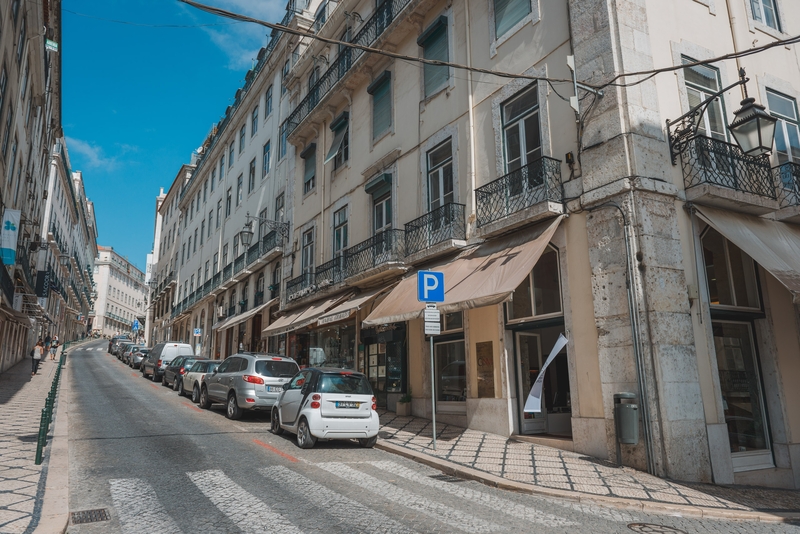 We were met at the airport and taken to our hotel in the hilltop neighborhood of Bairro Alto, where we stayed in the aptly-named Bairro Alto hotel. 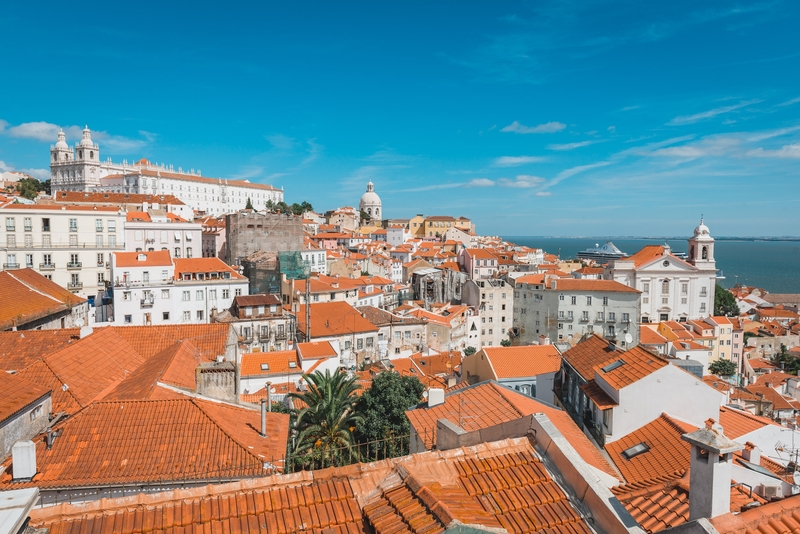 Lisbon is the capitol of Portugal with a population af about 500,000. 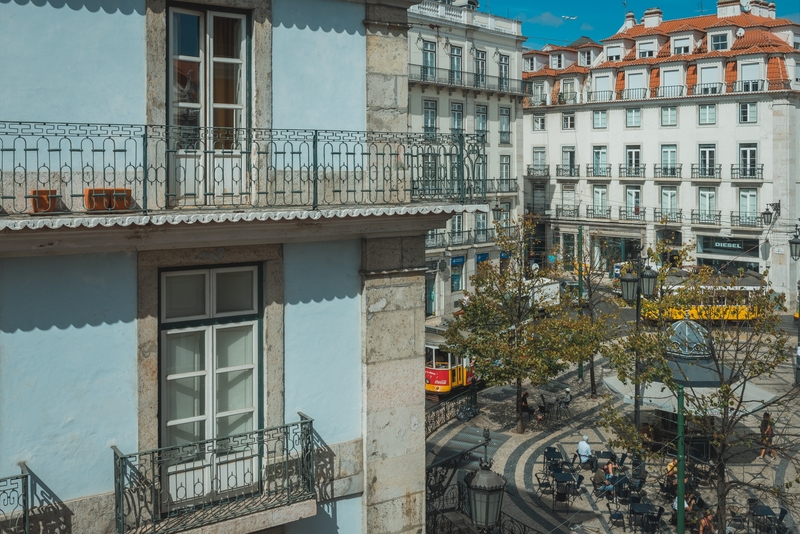 The City sits along the Tagus River about 25 miles inland from the Atlantic Ocean. The city isn't large, and is spread across seven named hills with steep and winding streets connecting each neighborhood. We opted to tour the city mostly on foot which is no small feat of athleticism. 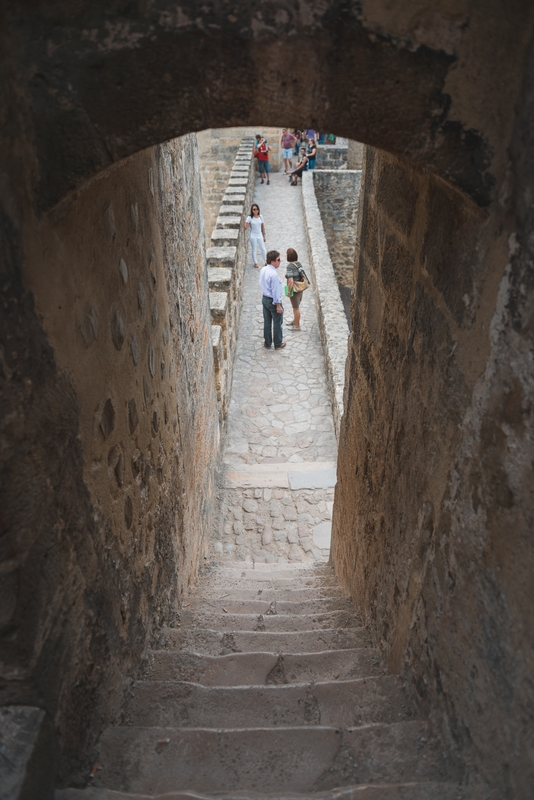 The streets are made of a beautiful tiled mosaic or cobblestones, and the hills are quite steep. 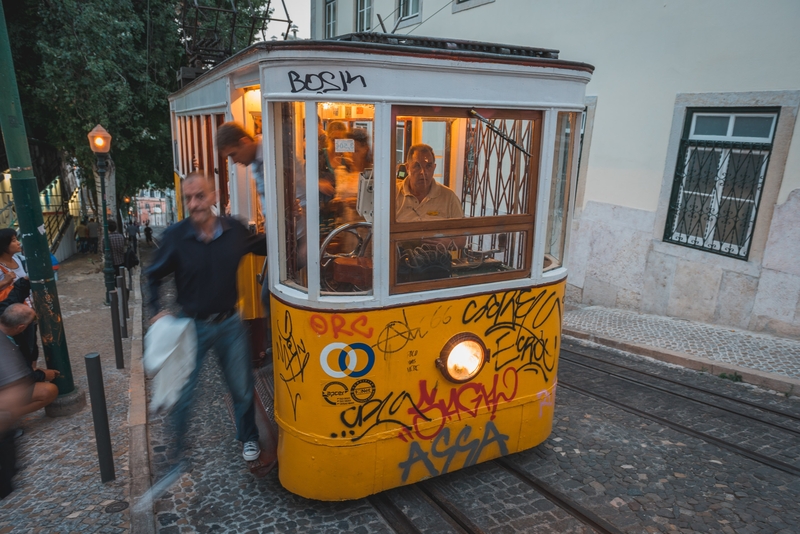 After two days of touring Lisbon on foot, you could definitely feel it in your joints. The official language of Portugal is, not surprisingly, Portuguese. Portugese is also spoken in Brazil and many of the former Portuguese colonies in Africa, Asia and countries that border Brazil. Written Portuguese is quite easy to understand if you're familiar with Spanish, Italian or French, but spoken Portuguese has a very distinct sound which I found very difficult to understand. To my ear, it sounds like a guttural Spanish with a heavy Russian accent. Thankfully, English is quite widespread and we never had any trouble communicating, even outside of the big cities. 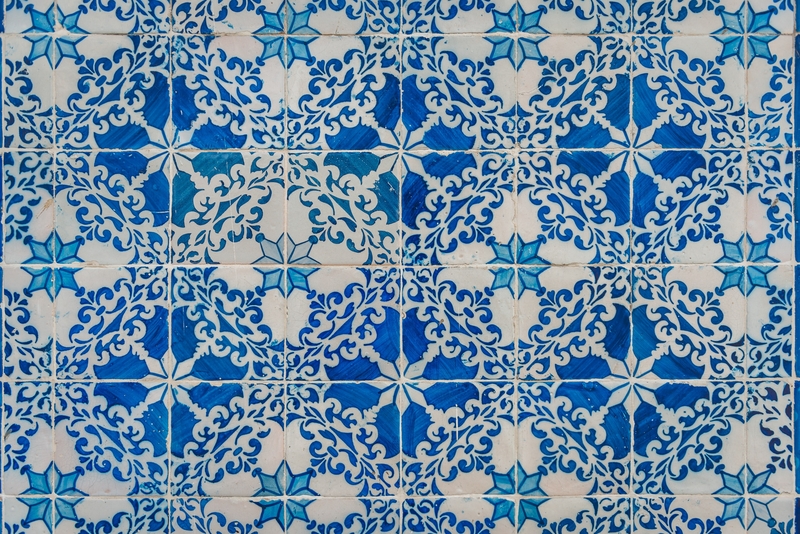 For centuries one of the biggest and most important industries in Lisbon was the production of ceramic tile. Nearly every building, church, sidewalk and street is covered in tile. There's a very well-regarded Tile Museum, which we had planned to visit, but didn't have the time. 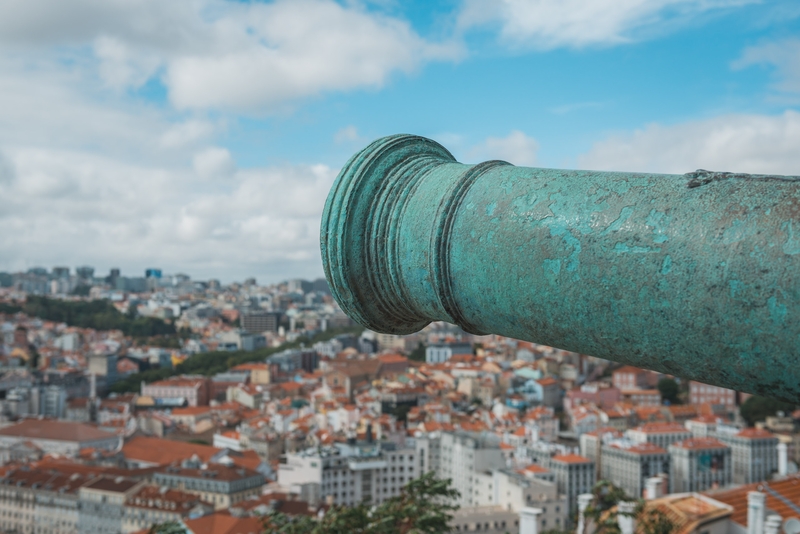 Instead, we focused day one on seeing the Alfama and Bairro Alto neighborhoods, and our plan was to see Sintra and the Belem neighborhood on day two. We set out on foot toward the riverfront to start our walking tour through the Alfama, but not before grabbing a quick snack along the way. 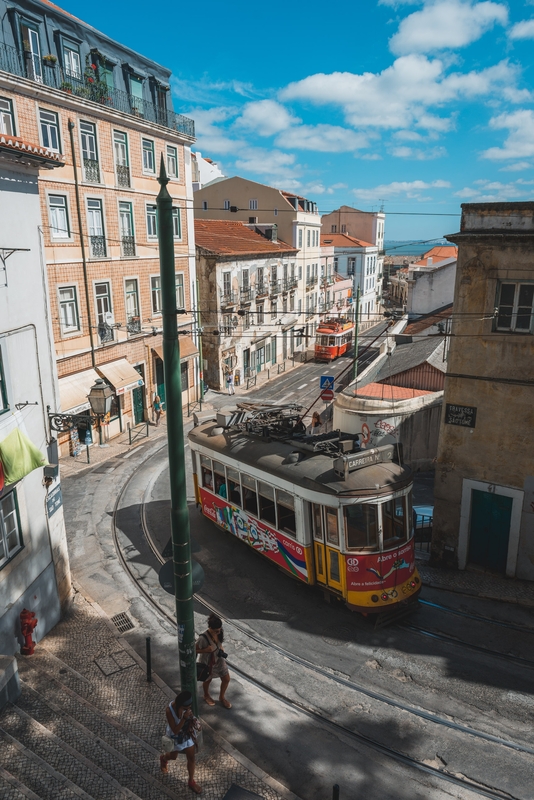 Much of the historic neighborhood of the Alfama can be seen from the cable cars that incidentally pick up right behind our hotel. We opted to do our touring on foot and catch the cable car later in the day. The cable cars are a magnet for tourists, and unfortunately for the the riders, also a magnet for the pick-pockets who prey on them. We saw a young German couple get completely cleaned out during our brief ride, and opted to stay off the cable cars for the rest of the trip. 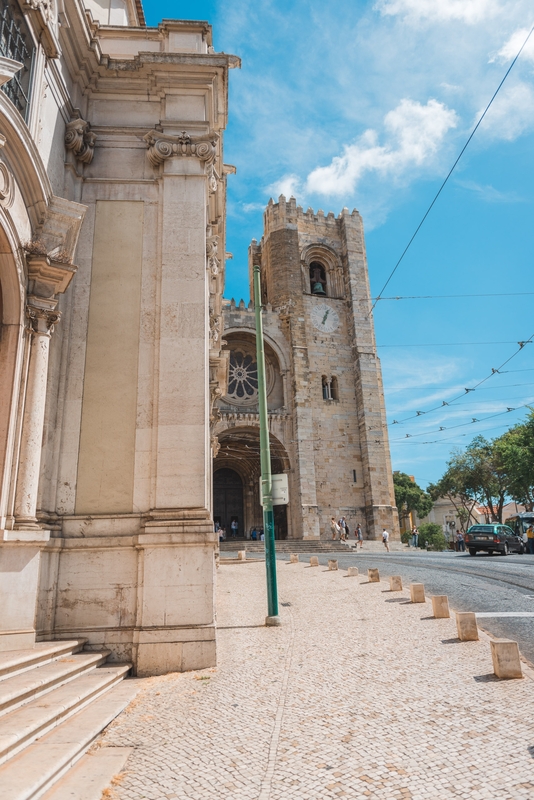 We walked up a long and winding street toward the National Cathedral of Portugal, the Se de Lisboa; a rather bland and understated structure with very little flourish compared to other big churches found across Europe. 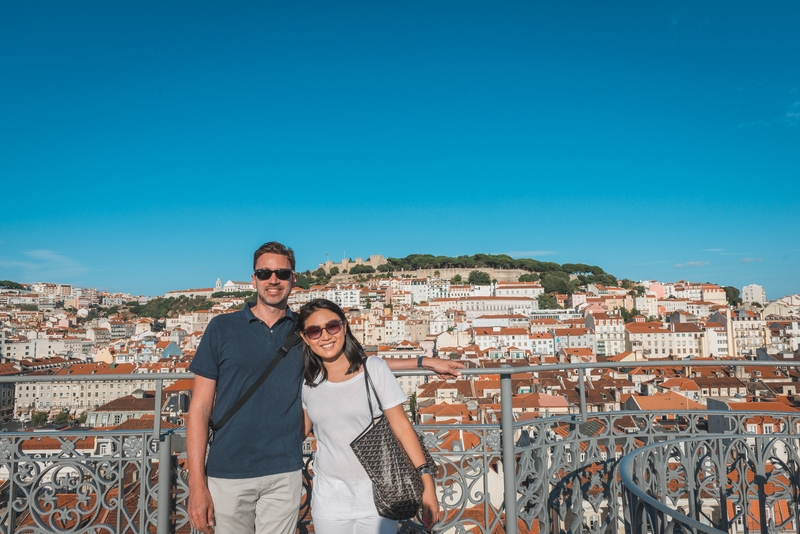 Our destination was a famous overlook, the Placa Miradouro, with it's postcard-esque views of the Alfama and Tagus River. The weather was nearly perfect; sunny skies and about 75 degrees. 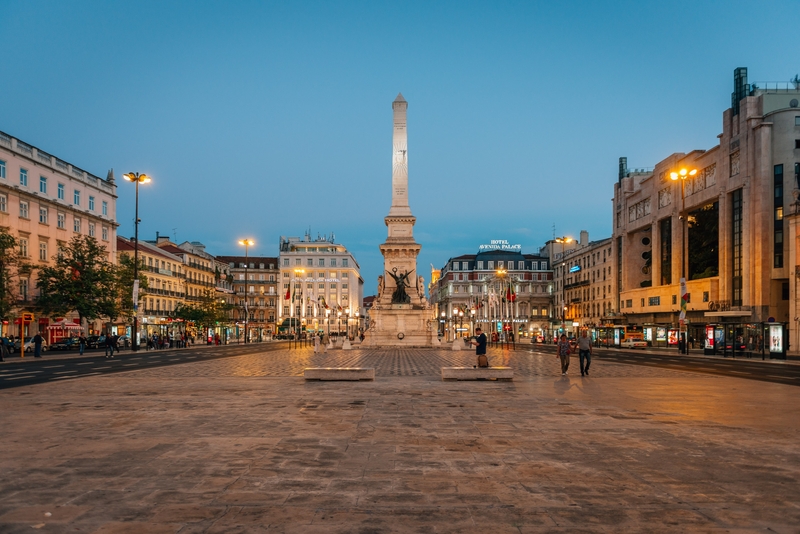 Lisbon is only a few degrees latitude south of New York (and almost identical to Kansas City), but due to its proximity to the ocean and river, the weather tends to be mostly mild and dry. Only a few weeks earlier it was hot, and during our visit we encountered some unprecedented and unusual rain, but for the most part the weather was perfect for sightseeing. 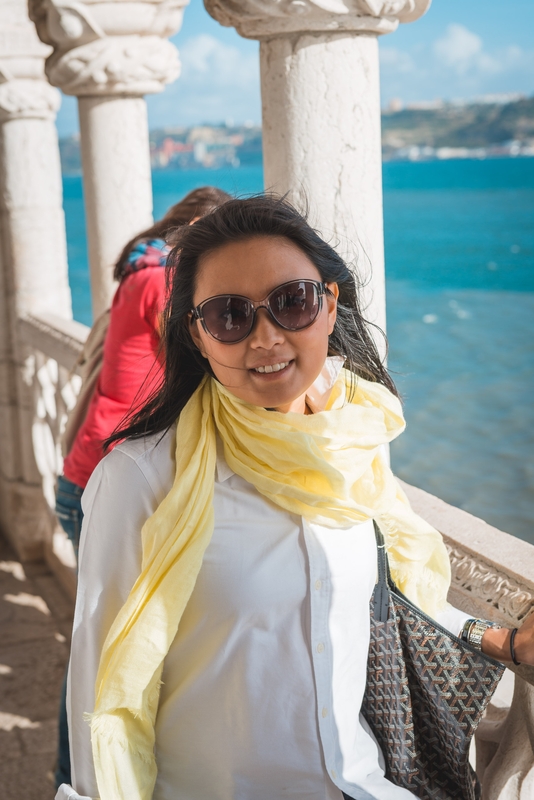 We stopped at a little cafe near the overlook to rest our feet, grab a drink and plot our route to the next destination, the hilltop castle of St. George overlooking the city of Lisbon. After a few wrong turns, we made it to the castle of St. George. The Castle was built by the Moors during their occupation of southern Europe, but was recaptured by the Crusaders during the Siege of Lisbon around 1150AD. The architectural style of the castle is similar to that of the Alhambra in Spain, but pales in grandeur and scale. Today most people visit the castle for its amazing views over the city. After our visit to the castle, we walked back through some of the more fashionable shopping districts along the route back to our hotel. 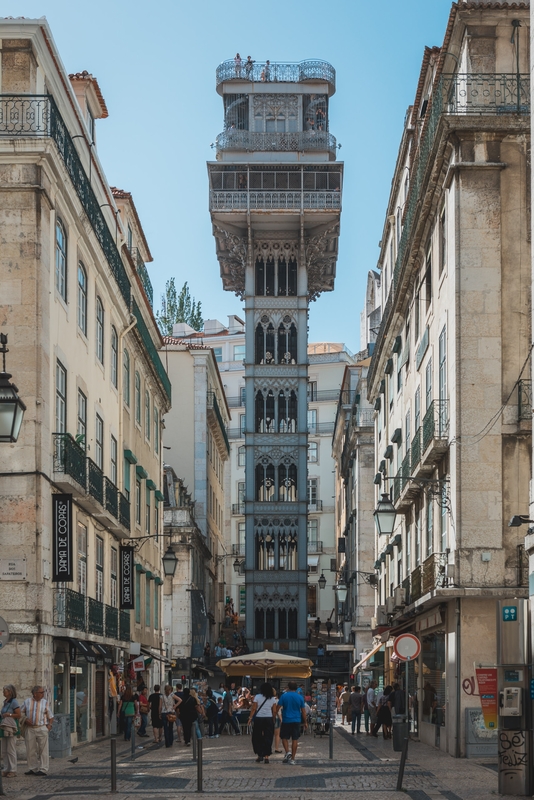 We included in our walk a visit to the Santa Justa Lift, and elevator constructed in the middle of town that carries pedestrians from the bottom of the hill to the top of the adjoining neighborhood. As tourists, this was fun and interesting, but the elevator and the two funiculars are a regular commuter route for many locals seeking to avoid the arduous hike up and down the hills. We finally got back to our hotel around 6PM and had some time to relax before dinner at the Michelin-starred Restaurante 11 ("restaurante" means "restaurant" in Portuguese, for those wondering at home). Despite the jetlag and the restless redeye flight, we were up until well past 1AM. Our plan was to visit nearby Sintra in the morning, but the weather forecast was unfavorable, and we ended up not getting out of bed until close to noon. We adjusted our schedule and expectations, and decided to have a quick lunch and see the riverside neighborhood of Belem. On our way to lunch, we happened upon a small shop selling only sips of ginjinha, a Portuguese cherry liquor. Given it was past noon, we decided it was perfectly appropriate to indulge in a local custom. The liquor was strong, but very smooth and tasty. It had a nice cherry flavor without tasting like cough syrup. Not a bad way to spend a Euro. 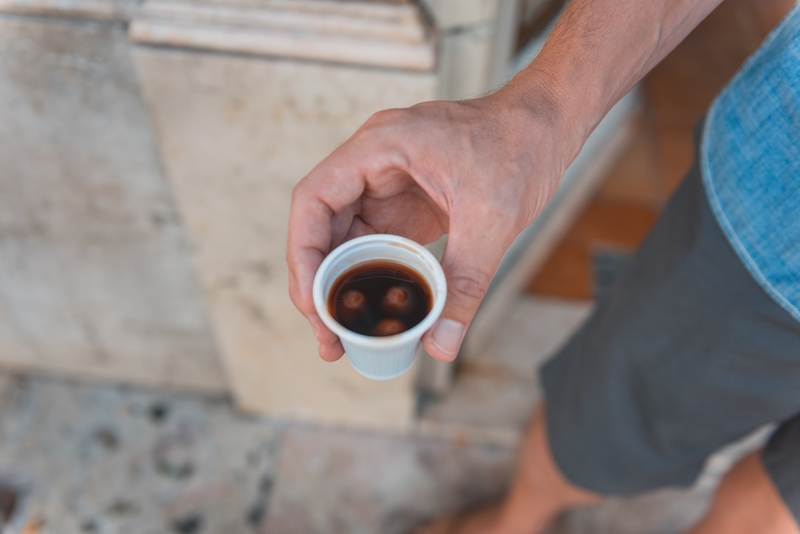 Later that evening, we found another ginjinha shop that serves its drink in a demitasse made of solid dark chocolate. I highly recommend it. Lunch was at McDonald's. We make a point of visiting a McDonald's in every country we visit, and to this day have upheld this tradition. We usually get chicken nuggets, whatever local beer served on tap and a featured local burger or sandwich. 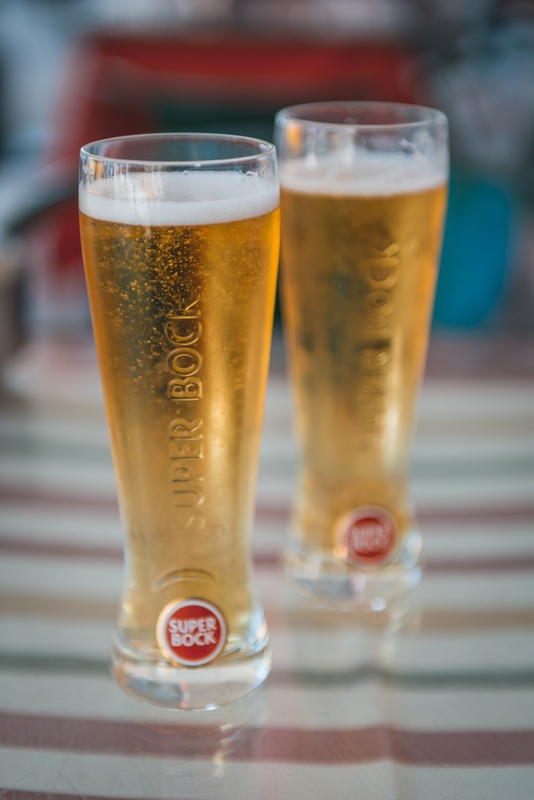 The beer was Super Bock, and the burger was an inedible item called the 1955 burger. I don't know the significance of that year, but the burger was dry and covered with a strange and unappealing sauce. I went back and got a Portuguese pork tenderloin sandwich which at McDonald's is called a McBifana. It was odd, but quite good and turned the meal around for the better. On a roll, we left McDonald's and stopped by a nearby Starbucks so I could get an "American Coffee" (as opposed to an Americano). They had to make it to order as the locals don't really drink brewed coffee. 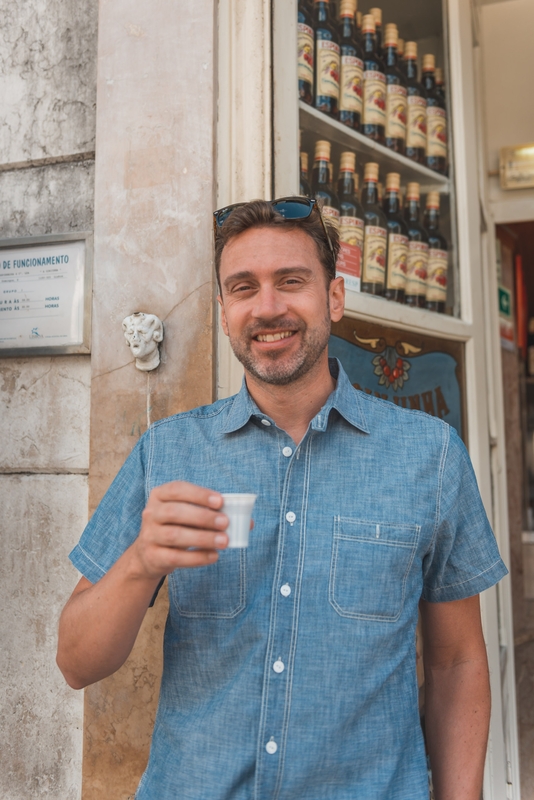 I like espresso, the preferred Portuguese coffee drink, but a "real" cup of coffee definitely hit the spot. After coffee, we made our way down to the commuter rail and took the train (not the cable car) to the riverside neighborhood of Belem. The train ride was about 15 minutes, but the walk would have been an hour or more and after the previous day's hills we opted for the convenience of the train. Our first stop was the Padrao dos Descobrimentos, or Monument to Discoveries. 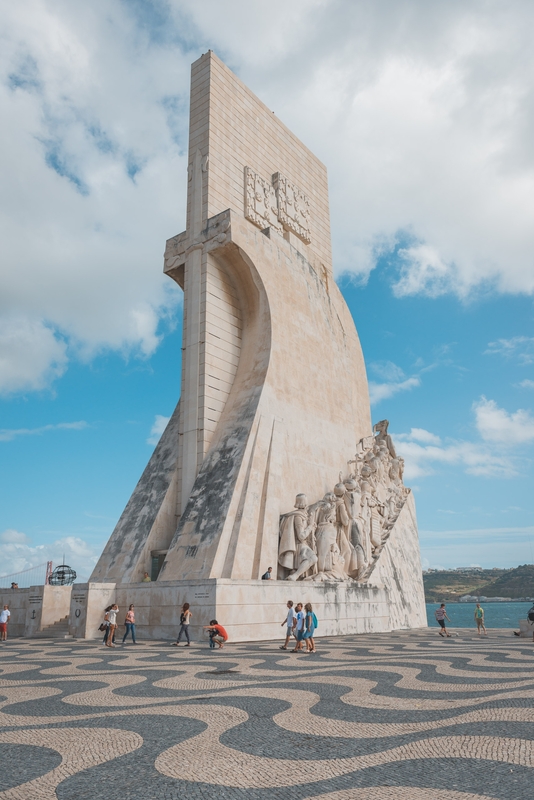 Unveiled in 1960, the statue is a monument to Portugal's legacy of exploration and discovery, and its opening coincided with the 500 year anniversary of the death of Portugal's Henry the Navigator. 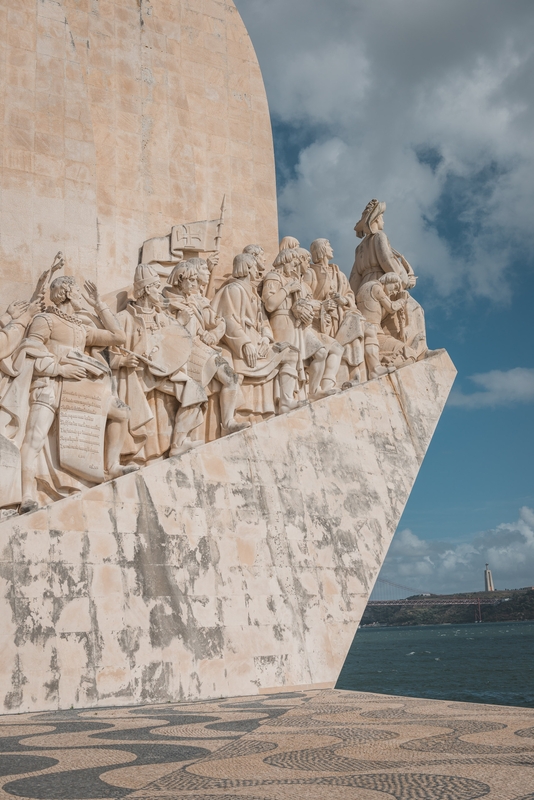 The monument is enormous, and sits on the banks of the Tagus River. 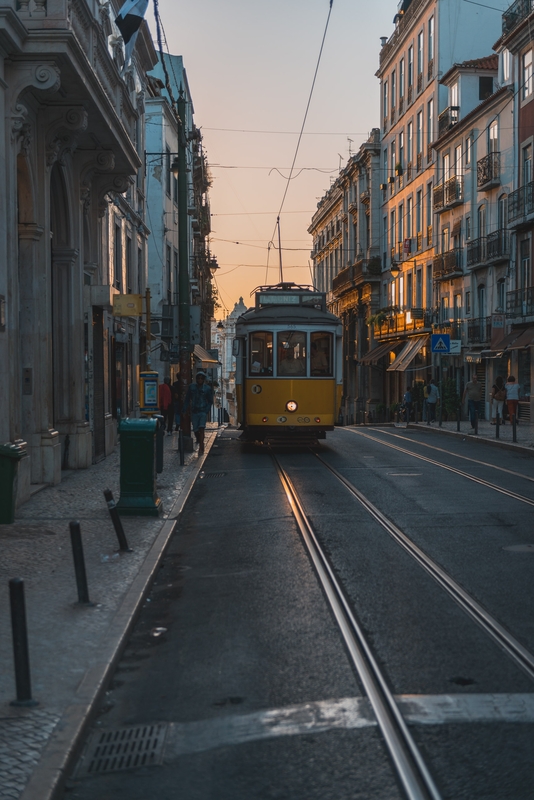 Its one of the most-photographed spots in Lisbon. A short walk away from the Monument to Discoveries is the Tower of Belem. 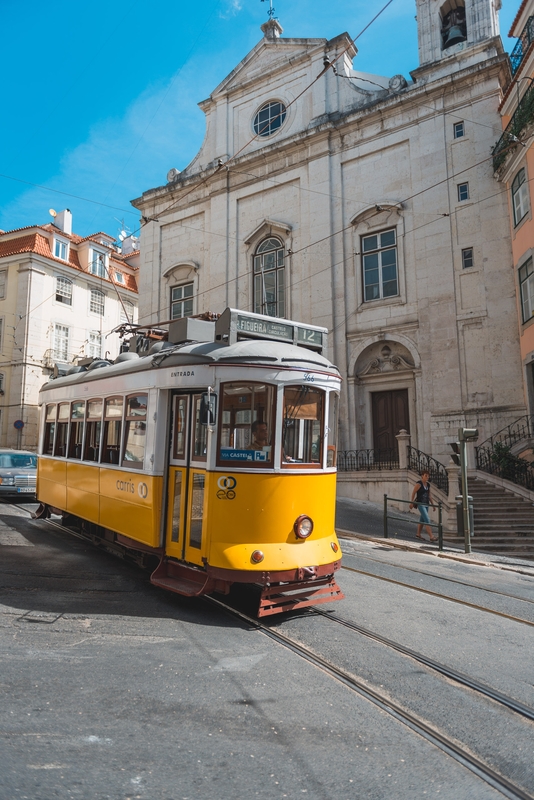 Along this route are many of Lisbon's art and history museums, which we opted to forgo on this trip. 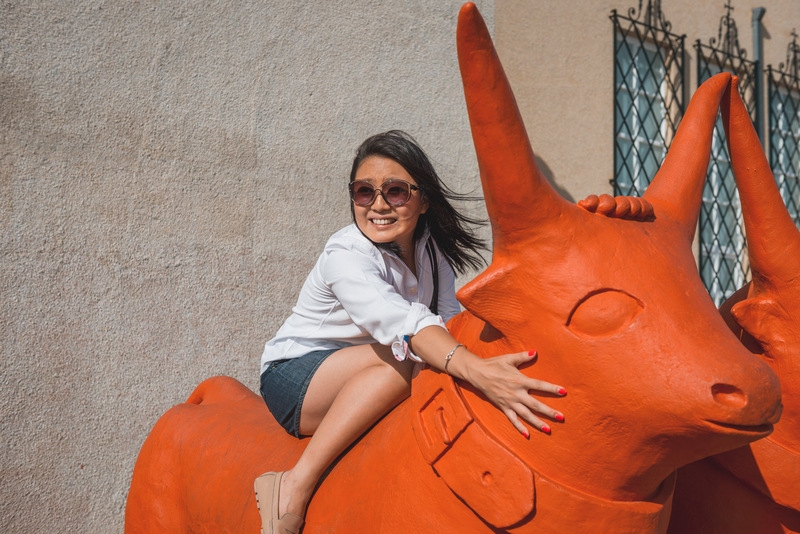 There was some large and colorful statuary along the route, and since everyone seemed to be climbing atop these for photos, so naturally we decided to do the same. 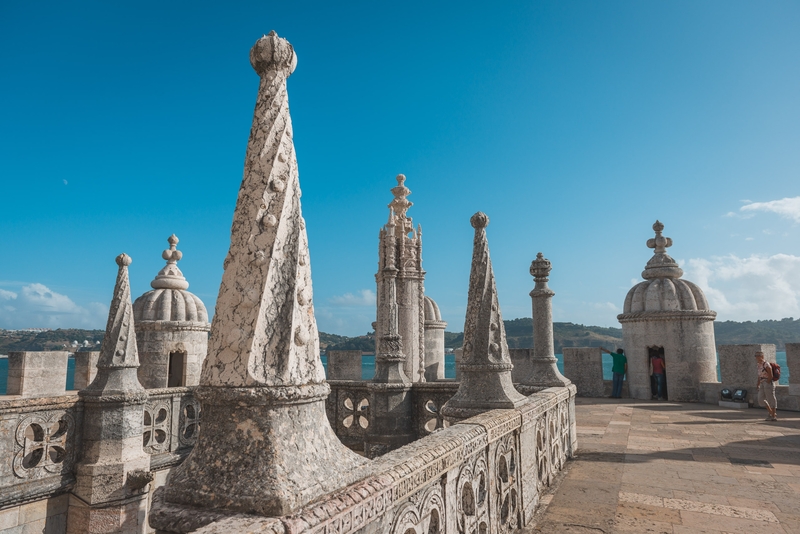 Our next stop was the Tower of Belem, one of the other most-visited and photographed spots in Lisbon. 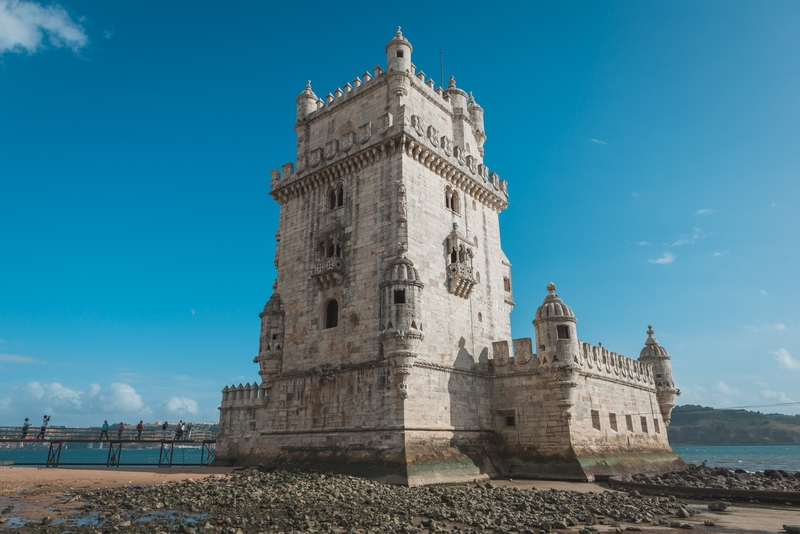 The tower was built around 1515 as a fortification against foreign invaders attempting to approach Lisbon by river. The Tagus river is immensely wide, so its unclear to me why invading ships wouldn't simply steer clear of this fortification, but apparently it was effective in dissuading invasion. The basement of the tower contained a small dungeon for notable political prisoners, while the first floor was a battery of cannons pointing in all directions. The top of the tower was used as a lookout, and given its position on the banks of the river, the tower offers unobstructed views up the river all the way to the Atlantic Ocean. 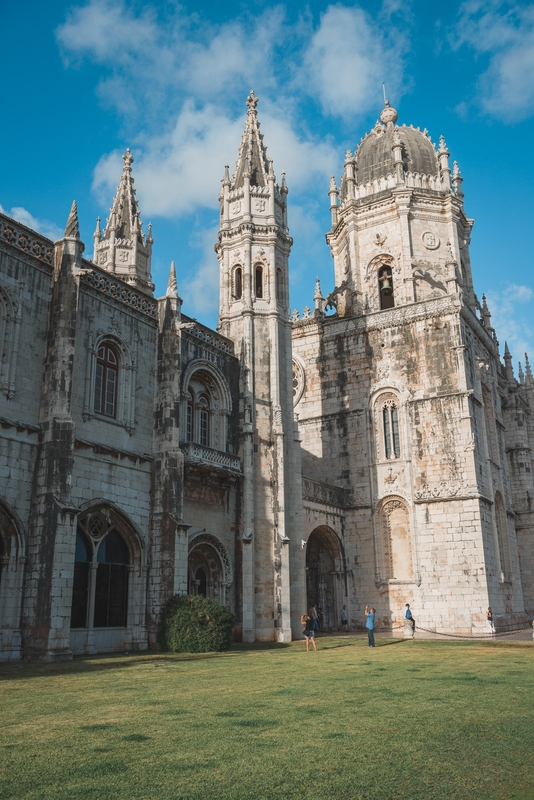 After our visit to the Tower, we crossed the road and made a stop by the Jeronimos Monastery. 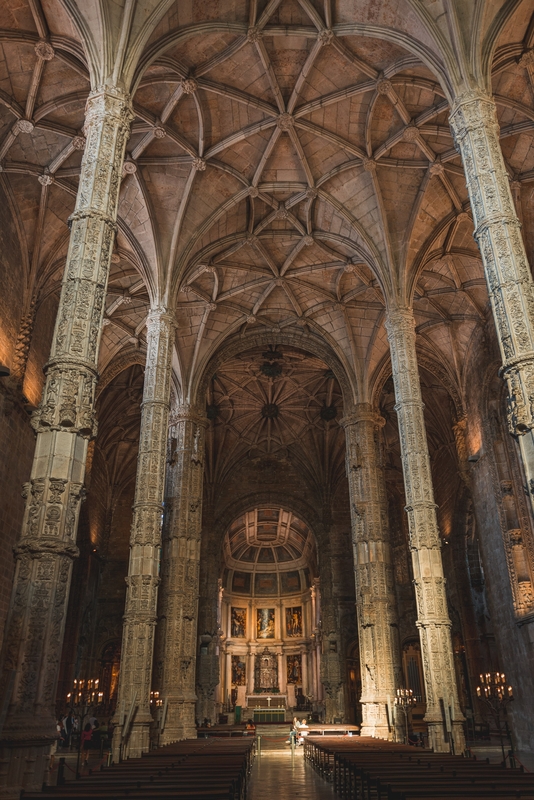 Built in 1495, its one of the largest and most elaborate buildings in Lisbon. We were short on time as it was closing shortly, but were able to see its famed chapel and amazing stained glass. 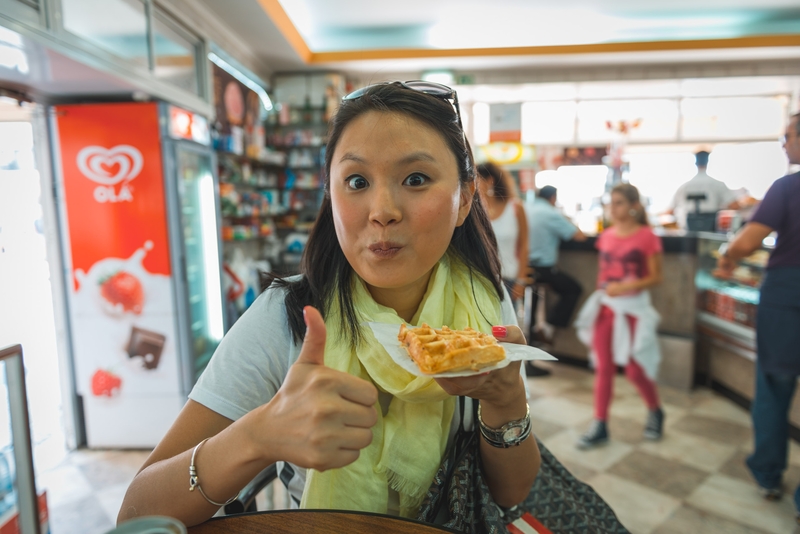 Monastery aside, the real point of this part of our tour was a visit to the famous Pasteis de Belem bakery, purveyors of what are widely regarded to be the best egg custard tarts in all of Portugal. 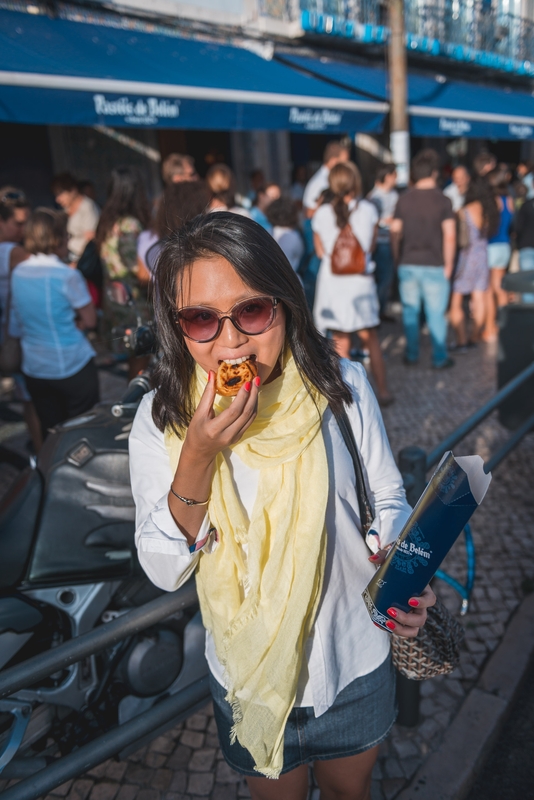 Egg tarts, or pastel de nata, is the national pastry of Portugal, a deserved reputation as they are simply delicious. Normally served at breakfast, they consist of baked egg custard in a pastry crust with cinnamon sprinkled on top (the crust is mostly butter, an additional plus). We waited about 15 minutes in line among hundreds of others to sample these treats and found them deserving of their praise and reputation. After our snack, we made our way back by train to have dinner at Bom Jardin, a popular tavern specializing in Portuguese food, especially their roast chicken piri piri and varieties of shellfish. After all the walking, we opted to take two funiculars, the Elevador de Bica to get up a giant hill, and the Elevador de Gloria to get back down another. As beautiful as Lisbon was, the city has a terrible graffiti problem. I found the city to be largely free of trash and otherwise clean, but every available surface had some kind of graffiti on it. Buses, trains, walls, buildings, fences, churches, stores, etc., were all marred by some kind of scrawl. I never did figure out why this is; perhaps its cultural, perhaps a result of the sovereign debt crisis that is roiling through Portugal at the moment, perhaps due to Portugal's 15.5% unemployment rate, the highest in the Common Market. Regardless of the reason, its a huge problem and one I hope they can correct as otherwise its a truly beautiful city. We enjoyed a late dinner and went back to the hotel to pack. The next morning we were taking an 8AM train to the city of Porto to start our tour of the Douro Valley wine region. We ended up having about a day and half to see Lisbon which turned out to be just barely enough. There was more to see, but I felt like we hit highlights and got enough sense of the city that we could come back and see more, but could focus elsewhere on a return trip. Given that Lisbon is likely your starting point in any visit to Portugal, I highly recommend spending 1-3 days to see the City. Bring some comfortable walking shoes. You're going to need them.